We’ve since become good friends. 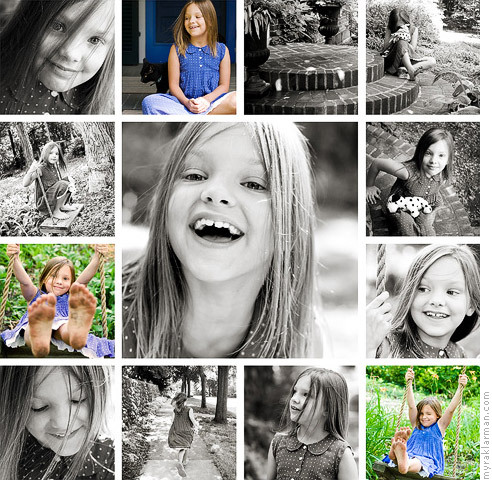 Dawn started her child photography business about a year before I opened Myra Klarman Photography, and she’s always been very generous with advice and suggestions. She even played a huge role in making my online proof gallery interface so clean and usable. Yesterday on her blog, Fresh, Dawn shared a photoshop storyboard template she made for photographers to download. I gave it a spin and I’m hooked! It may take a while to get a dynamic arrangement, but I think the results are worth the effort. Using my new template from Dawn Mikulich. I love how this 8-year-old’s portraits play off each other in this configuration. You can almost get a sense of how much we ran around together during the session! Dawn also sells art prints of and usage licenses for a growing collection of her own Chicagoland photography (1201 images and counting) through a website (of her creation) called Chicago Uncommon. All the photographs are tagged, and finding specific types of images is easy. The whole venture is smartly done and more than a little ingenious. Her energy level and positive personality are so enviable. When she had her daughter Kendall late last year, it didn’t seem to slow her down one bit. Okay, maybe a little. But I’m still astounded by what she manages to accomplish — and with such aplomb! I got to photograph this adorable mother and son for a surprise birthday present for Daddy. 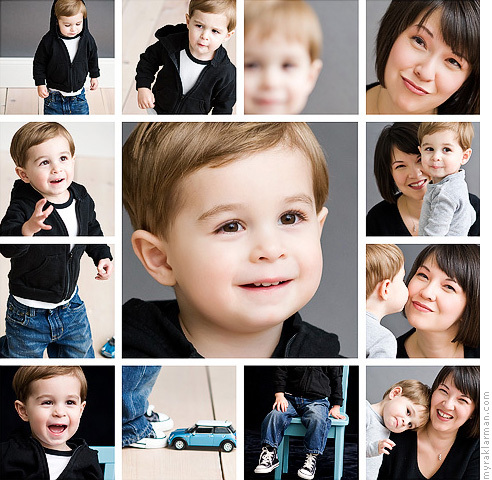 The template allows me to show all the playful moments I captured — at a glance. I love what you’ve done with the template and as always your work is gorgeous. Very inspiring! I love how you used 2 squares with the same image. It totally works. The photo mosaic is a great way to present. You manage to capture your clients, large and small with such clarity.